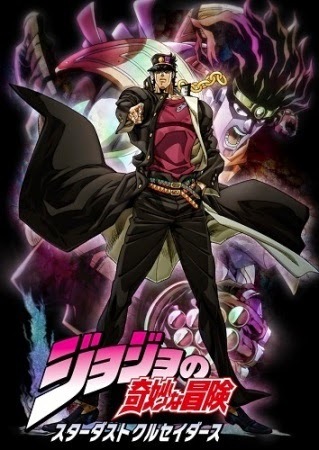 Anime adaptations of video games and other licensed properties sometimes receive a bad reputation due to their nature of being produced solely to make a quick buck based on namesake. Persona 4: The Animation is a curious case of trimming a fifty-plus hour JRPG into a twenty-six episode series. There’s a lot to consider with such a bold undertaking – what gets left on the cutting room floor, how do the writers properly convey such a large and diverse main cast, and how could the variables unique to each individual player’s experiences factor in without alienating viewers? The result, while perhaps not perfect, is one of the more successful forays into adapting a video game to anime in recent years. As with the video game, Persona 4: The Animation begins with Yu Narukami moving to the small town of Inaba to live with his Uncle Dojima, the local detective, and young cousin Nanako. Early on during his stay, Yu hears rumors of a television broadcast that airs rainy evenings as the clock strikes midnight, and begins to formulate with his friends and classmates as to whether this Midnight Channel might share any connection to a recent string of murders in the area. 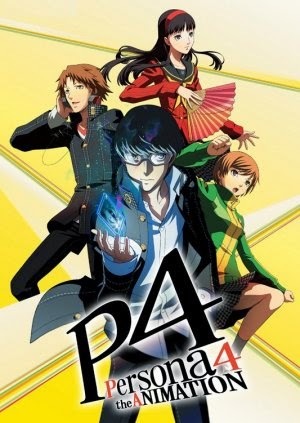 After a few brief ventures into the world behind the television screen, Yu and friends learn they must face their inner selves in order to call upon the Arcana powers of their own unique Personas and face off against the violent Shadows that inhabit the TV realm. Yu is the lone exception to the rule of everyone hosting a singular Persona, as he can forge bonds with his friends and locals in order to expand his capabilities. 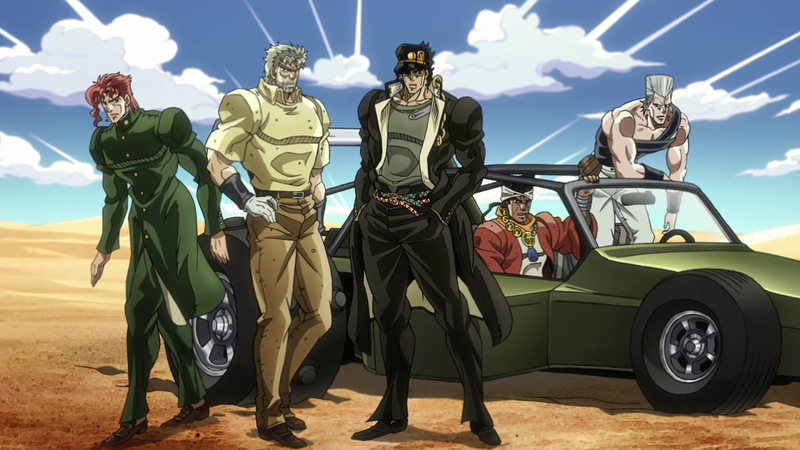 While the actual process of his forging social links is largely glossed over in this anime version due these being left largely up to individual players’ discretion in the video game, a few episodes see Yu interacting with NPCs and taking time away from the murder case in order to help an old lady and tutor a child. 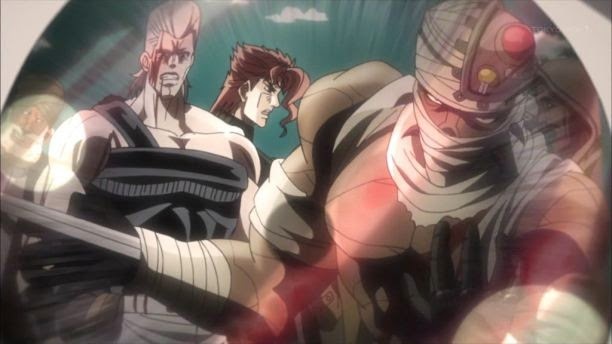 The dungeons are typically completely explored within a single episode each, as the anime is less concerned with the process of fighting hordes of enemies and opening treasure chests, opting instead to place greater emphasis on the investigative team facing their shadow selves and subsequently revealing more about their personalities and character traits. Key non-combat events from the game also receive ample attention, including the school camping trip and Miss Yasogami beauty pageant. It provides a fresh break from the otherwise intense atmosphere and darker color palettes within the TV world. 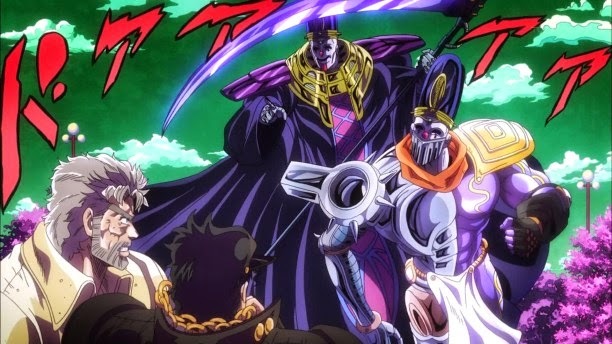 The animation style itself is highly reminiscent of the few fully-animated cutscenes from the video game, though Persona 4: The Animation has a notably higher production quality than said sequences. A few new subplots, such as Nanako dressing up as a magical-girl-meets-Sherlock-Holmes anime protagonist and tailing Yu to find out what he has been up to all summer break, add a bit more lighthearted storytelling that is welcome in putting a slight spin on a story otherwise quite familiar to those who have already poured multiple days worth of time into the video game. The majority of the cast from the video game’s localization return for the English dub of the anime, with only a couple change-ups – Chie’s being the most instantly noticeable, due to how heavily involved in the story she is from the outset. Johnny Yong Bosch’s voice work for Yu Narukami is a real treat – while he may not be highly talkative in order to preserve a sense of neutrality and focus the story more on Yosuke, Yukiko, Kanji, and so on, there are certain points in the anime where he will deliver lines of dialogue that would be considered the strange or obscure options in-game. This often creates evokes humorous responses from his companions. With many of the gaps bridged due to the anime not covering so much of the downtime between dungeons, Naoto’s inclusion in the story is more consistent, and Margaret prefaces nearly every episode, giving the Velvet Room a constant presence, though one that is left largely unexplained in this version of the story. Dojima is effectively reduced to a one-dimensional and often bitter individual, which makes his shift to becoming a more caring parent in the later episodes both sudden and clunky. As is only to be expected, the endgame storylines see slower pacing in order to fully prepare viewers for the multi-layered revelations. They remain just as half-baked as in the video game version, however, and it is a shame that both interpretations of Persona 4 stumble over themselves so late in their runs. Aside from a couple of the events signifying a maxed out social link being shuffled around to places that proved more convenient in this version, Persona 4: The Animation remains largely unchanged from its video game counterpart, and given how story-heavy the game was to begin with, that’s probably just as well. There is little revolutionary about this adaptation, but at the same time, it does exactly what it sets out to do, offering ample time to highlight Naoto’s gender dysphoria, Rise’s stress from life in the spotlight, and Teddie’s existentialism. Following the endgame events of DmC, Vergil finds himself trapped in a chaotic realm that seems to give physical form to all his inner turmoil. Still failing to understand how Dante and Kat could deny him his vision of a new Nephilim-governed world, Vergil’s calm and composed demeanor begins to deteriorate as he chases down apparitions of Dante, his mother, and plenty of monsters similar to those he and Dante faced in the city of Limbo. This DLC pack – which includes multiple chapters in a similar, albeit considerably shorter format as the main game – recycles some environmental assets, placing them against a red nebulous backdrop where floating platforms and blue vortex doorways are commonplace. 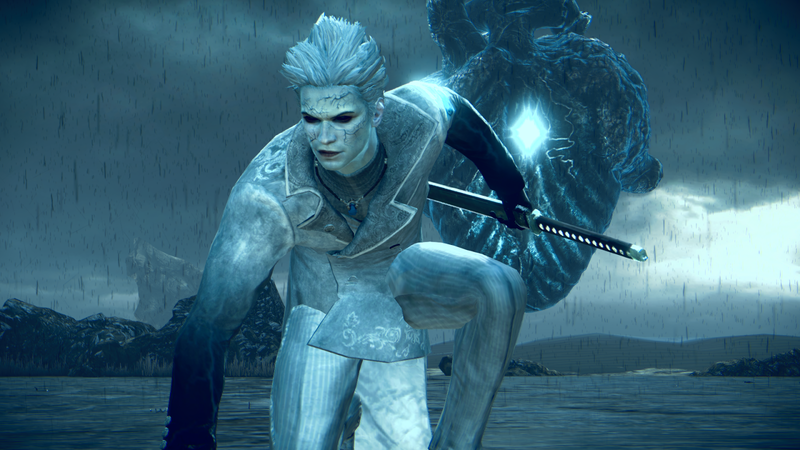 Vergil’s attacks are considerably faster than those of his brother, and can be upgraded in the same way to increase damage and offer a wider variety of ways to take down foes. Aerial juggles and charged power slashes prove practical for dealing with a handful of weaker grunts, while Vergil’s airborne daggers stand in for Dante’s Ebony and Ivory handguns. A couple of key abilities unlocked late in the DLC as part of the story’s progression prove a real treat, though their fanfare is unfortunately short-lived. Whereas Dante had both Angel and Demon weapons he collected during his missions for the Order, Vergil’s sword Yamato can take on either form with the press of the left or right trigger respectively. Angel attacks do less damage, but allow Vergil to dash about the stage at ridiculous speeds, while the slower Demon slashes do considerably heavier damage that is ideal for quickly boosting the combat ranking from D to S.
Vergil’s Downfall lasts a couple of hours, and while most of what lies in wait is rather predictable, the story does hold a couple of unexpected twists that provide greater insight into the antagonistic brother’s outlook on those around him. The dialogue is rather lazily scripted, but the game doesn’t get too bogged down with telling it, opting instead to let you enjoy the combat and seek out hidden health crosses and lost souls as much as possible. Vergil’s Downfall also takes a curious approach to its cutscenes, with most bearing a thickly-stenciled noir motion comic style instead of fully-rendered 3D character models and environments. Though a stark contrast to the core gameplay of this DLC package, it does not feel out of place, just somewhat lazy, given how stiff the motions are of each and every character rendered in these sequences. Though the finale of DmC gave us something of a teaser of what might lay in store in a possible sequel game, Vergil’s Downfall would appear to be more concrete indication that Capcom and Ninja Theory intend to continue with this boldly reimagined vision of the Devil May Cry series. There is little complicated about the direction of Vergil’s Downfall – it’s not terribly lengthy to burn through once, though it does offer all the same variable difficulty settings as the core game. 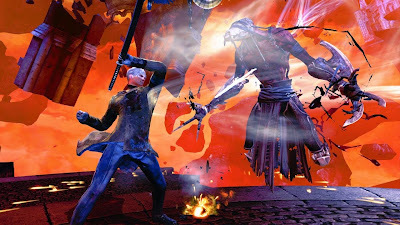 Vergil’s Downfall is an epilogue that plays out as a short and streamlined version of the core gameplay familiar to anyone who has already completed DmC: Devil May Cry. It’s the start of a new school year, and a high school student has moved to the small town of Inaba to live with his uncle Dojima, a local detective, and young cousin Nanako. Shortly after his arrival, this high schooler learns of a few odd happenings around Inaba. First is the Midnight Channel, a static-laden television broadcast that seems to display the faces of certain locals on rainy nights as the clock strikes twelve. Second is a series of murders that, while involving victims who were seemingly unrelated, may be connected through their faces appearing on the Midnight Channel prior to their deaths. After making a few friends among his classmates, this newcomer decides to investigate the murders, utilizing a newfound ability to enter a world behind the television screen and call upon the Arcana powers of Personas. The ability to utilize multiple Personas and their varying powers and skill sets is what sets the player-controlled protagonist apart from his comrades – you, the player, are able to adjust your own play style on the fly. You are only able to take three others with you into any given dungeon crawling session, and while some are better suited as healers, physical fighters, or stat boosters, each tends to specialize in at least one type of magic. 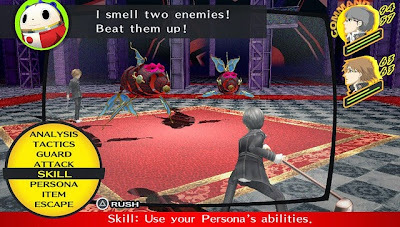 In the case of Yukiko, her Persona hits foes with fire attacks and can also heal up party members, while Kanji is more focused on physical attacks at the cost of some lost HP, as well as electric attacks and a couple of boosts to your party members’ stats. In order to best compliment the offerings that your companions bring to the fight, you will need to visit the ethereal plane of the Velvet Room and fuse Personas that you collect from defeating enemies. 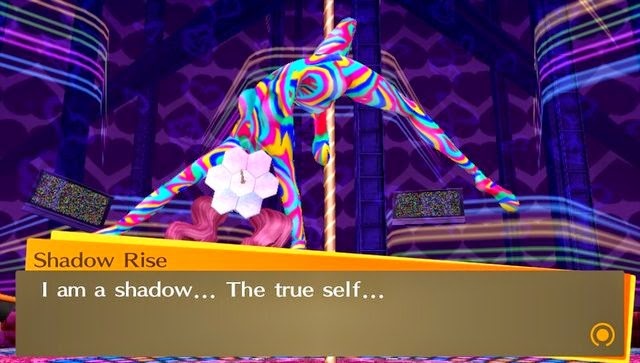 Each Persona is attributed to a different symbol of the Arcana, such as Death, the Tower, the High Priestess, the Hierophant, the Chariot, the Lovers, and so forth. Building up your social links in-between your dungeon crawling sessions is key to earning experience bonuses when fusing these Personas and granting your allies a greater range of abilities in battle. Maxing out every social link in a single playthrough is impossible, so it’s up to your own discretion in determining which social links you wish to pursue. Those associated with jobs and tasks around town typically take less time to complete, though the bonuses earned from your party members’ social links are always more significant, making the extra time it takes to complete them all the more worthwhile. Social links with some of the female party members and classmates can also open the door to romantic pursuits, though these are not necessary and you can opt to remain as friends – it will simply prompt altered and extra dialogue segments after you have cemented an intimate relationship. With the option to participate in sports and school clubs, take up part-time jobs, spend time fishing, tutoring, and so on, no two playthroughs will be quite the same. 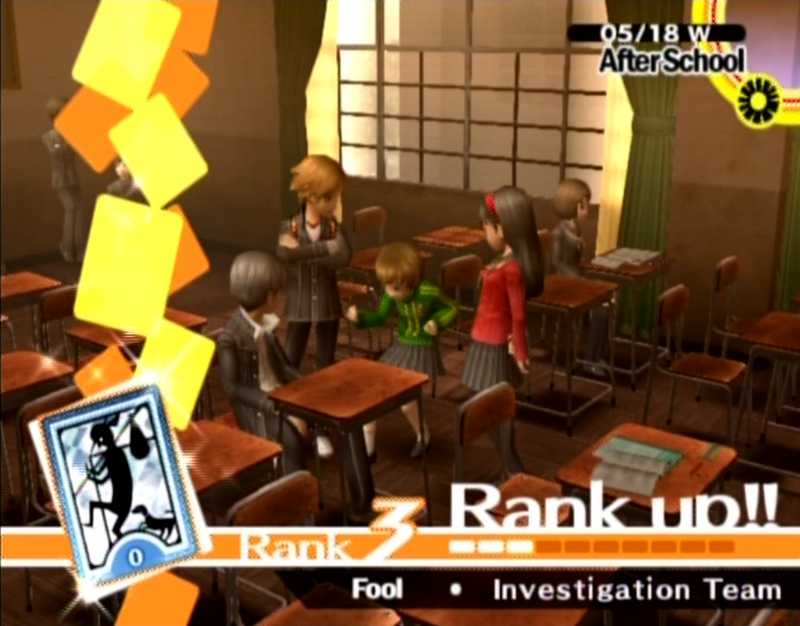 The large amount of downtime in-between dungeons is one of the elements that sets Persona 4 so far apart from many of its JRPG contemporaries. Which of these tasks you decide to take up will boost your skills in Understanding, Diligence, Courage, Expression, and Knowledge, and jobs will net you extra cash depending on how devoted or focused you are. Meanwhile, the dungeon exploration segments are reminiscent of some of the older Final Fantasy titles, with multiple sprawling floors of interconnected chambers and hallways, and enemies that become tougher the higher you climb. While the earliest of dungeons are host to classic fantasy aesthetics, later locales includes a sauna, an anime-style secret base, and a metaphysical 8-bit video game. Each dungeon concludes with a challenging boss fight, though each boss has a relatively predictable pattern of attacks, buffs, and defensive options. While these could not be more different from one boss encounter to the next, you may find that being beaten the first time you attempt to take on one of these powerful foes will grant you a more solid plan of attack with the next attempt. Later dungeons include a mid-dungeon miniboss encounter, while every dungeon includes two kinds of chests – small chests, which often contain health and magic-replenishing items, and golden chests, which must be opened with keys that are sometimes earned from fallen enemies. These golden chests often contain weapons or armor, as well as rare and valuable materials for crafting at the local metalsmith. Persona 4’s approach to the dungeons is highly unorthodox, as it is not required that you complete each dungeon in a single attempt. Rather, you can tackle any given dungeon over the course of multiple days (or multiple weeks, even). The only risk you run of seeing a ‘game over’ screen is if you do not reach the end of a dungeon by the time heavy rain and the fog that follows are to set in, which would effectively see to the death of whoever has been thrown into the television world at that time due to the enemy shadows growing overly powerful. 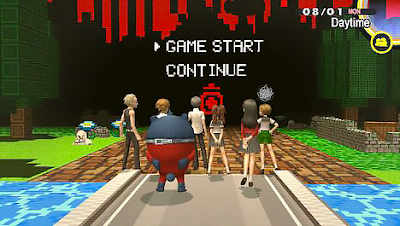 However, Persona 4 suffers from an archaic save system, in that the only places you are able to save the game are the hubworld area within the Midnight Channel, and the final floor preceding each dungeon’s boss fight. And while it would be fine and dandy to save after you’ve cleared each and every floor of each dungeon, the amount of money you would waste on the Goho-M items which warp your party back to the dungeon entrance would prove ludicrous in the long run. This certainly adds an old-school RPG challenge factor to the combat-heavy portions of the game, but it can also be quite frustrating, especially in the earlier dungeons when you have a less concrete idea of how tough the enemies that lie in wait ahead are going to be. When you do square off against enemy Shadows, it is important to learn what sorts of attacks each is weak to, as well as what your own Personas a weak against. Hitting an enemy with whatever they are weak to will net you both a critical hit and an immediate bonus strike to either finish them off or to focus your efforts on another enemy on the field. Ocassionally, your allies will request to perform a strong physical attack, which will always end in a critical hit. These criticals, as well as the ones earned from exploiting an enemy’s weakness, will cause them to fall down. If all foes in a fight have fallen, your party can then band together to pile on in a cartoonish cloud of dust and sound effect symbols, dishing out a heaping helping of damage that frequently finishes those enemies off. After your newest ally faces their shadow self at the conclusion of a dungeon, they will begin to open up to you about their insecurities and personal struggles. For some, these are more commonplace pressures of feeling the need to please family and friends, or adhere to certain expectations that others have for them. In a few cases, the game takes a very twenty-first century approach to deconstructing characters by exploring their confusions regarding sexuality and their own gender identities. Persona 4 does a magnificent job of tackling these in a pointed manner while still maintaining its often cartoonish and comedic routine, which goes a long way in advancing classic staples of the JRPG subgenre, hand-in-hand with the highly-creative dungeon designs and emphasis on non-combat subplots and game mechanics. 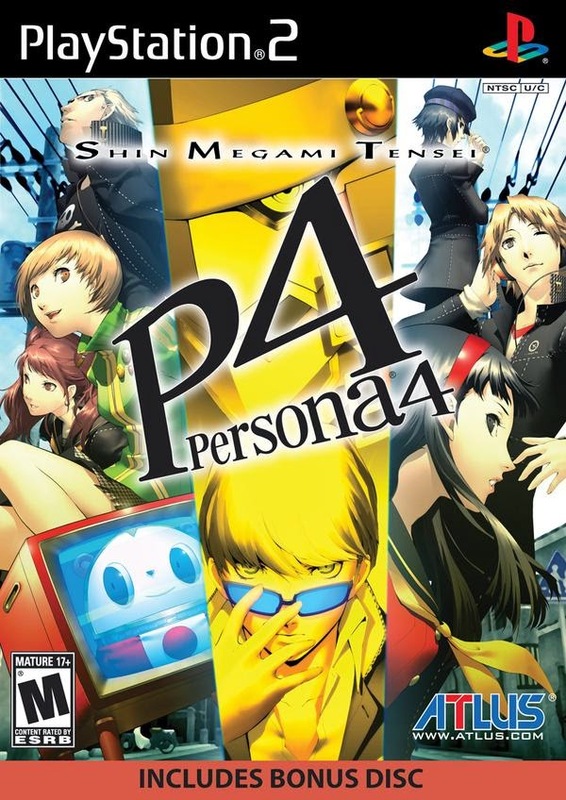 While Persona 4 does well to consistently deliver generally high quality and quantity for the sum of its parts, the endgame stretch does fall victim to a streamlining process that robs the experience of some of its quirky spirit as well as the previously high degree of interactivity and player freedom. The last few hours of the game effectively become a series of pre-scripted dialogue sequences, some of which can result in a ‘bad ending’ cutscene if selected improperly. The motives for key individuals will also likely leave a great number of devotees disappointed, given how uninspired and plain stupid they are both in the context of the game world and as general driving forces for character development were they to be applied to a story in any other medium. That said, most of the party members weave stories that pan out in rewarding manners, so while the experience does see some significant falters later on, the journey taken there is, by and large, an excellent modernized spin on the fundamentals of classic JRPGs. 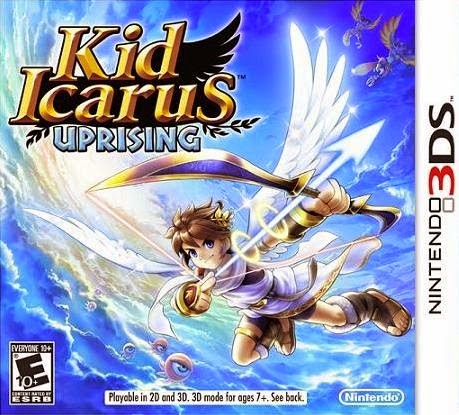 Following up on his return to the scene in 2007’s Super Smash Bros. Brawl, Pit once again takes flight in Kid Icarus: Uprising for the 3DS, a game that combines arcade-style on-rails shooting sequences with ground-based adventure and action elements. The story begins with a simple-enough premise: the forces of the Underworld are spreading across the Earth, and Lady Palutena suspects Medusa is responsible for this sudden influx. Calling upon her most trusted angel Pit, Palutena mounts an offensive against these ruthless invaders, with her ultimate goal being that of the retrieval of the Three Sacred Treasures, relics which were previously used to defeat Medusa and which hold the power to do so once again. Nine missions later, and the game leads you to believe you have bested the greatest threats of myth, only to shatter this illusion by revealing Hades as the true villain. Pit has seen only the tip of the iceberg with regards to the many foes he will face and the factions that will attempt to take advantage of the conflict between the forces of Skyworld and the Underworld. That is one of the greatest advantages both the story and gameplay have in Kid Icarus: Uprising – there is always a surprise waiting around the corner, whether it is the game duping you into believing you’ve reached its conclusion before you’ve reached even the halfway marker, the inclusion of a top-down scrolling shoot-‘em-up segment in the vein of Space Invaders, or the use of vehicles to traverse both the Earth and the stars. The game’s sense of humor falls into a similar category, often making fun of itself, and even more frequently seeing Palutena and goddess of nature Viridi poke fun at Pit, who – noble as he may be – is naïve and perhaps too reliant on Palutena’s powers at times. 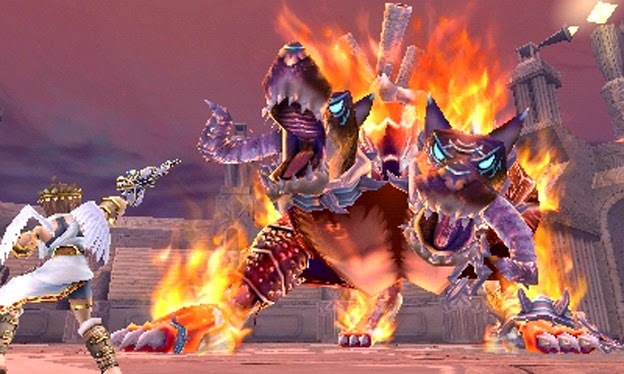 There are references to other Nintendo properties, like when Pit quips that a certain enemy type resembles the parasitic Metroids, to which Viridi corrects him that the two fictional video game universes apparently share no connection. For such a grandiose revival of a series that has remained dormant for twenty-one years, it’s comforting to see that it doesn’t take itself too seriously, despite all its successes in design. The gameplay is intense throughout, as enemies come at Pit from all directions, and in increasingly greater numbers. With rare exception, practically every chapter begins with Pit soaring through the skies, guided by Palutena’s power, as he shoots down airborne forces of the Underworld. These sequences are relatively simple to control, with the joystick moving Pit about the screen, and the stylus aiming his shots. 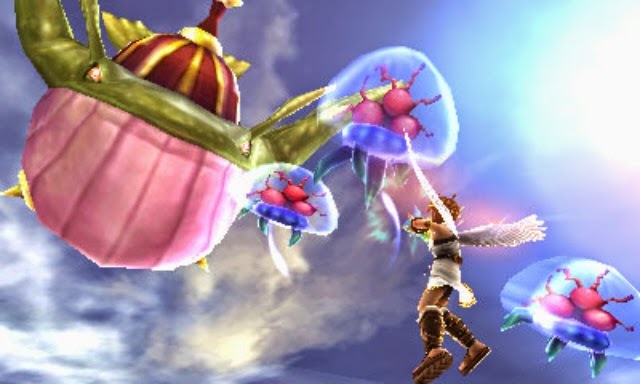 Enemies that get too close will instead be struck by a blade attack, and there are typically only a few predetermined chances for Pit to heal before his feet touch the ground. The second segments of each chapter generally see Pit land in some town, fortress, vessel, or other large structure to face off with enemies on a more personal level. Pit can dash for a brief period of time, dodge enemy fire, and charge up shots. He can also scour treasure chests for healing food items, optional abilities, and temporary items of aid like a protective shield or bomb. As these ground fight sequences generally make up the latter half (or more) of a chapter, they frequently end with some sort of boss fight, each of which mixes up the familiar formula of firing, dodging, and going in for quick and hard strikes just enough by including grind rails, chariot races, and environmental hazards into the fray. The boss fights are not equal in their degree of difficulty or intensity, but they are memorable encounters, nonetheless. Between stages, players have the option to sell weapons they have collected within each stage or fuse them into greater tools. Some weapons are more powerful in close-quarters, others better with range, and finding one’s personal preferred balance between these and optional upgrades like healing factors, quick-charge shots, stationary energy shields, and more adds a great degree of freedom in playing with whichever strategy you so desire. At the start of each chapter, the game will ask you to bet hearts – the in-game currency – to determine both the difficulty factor and potential rewards. More hearts bet means there is a greater chance of earning more in return, but Pit will also take significantly more damage when hit. Most stages reward more adventurous players by including areas only accessible on higher difficulties, and these can include treasure chests with rarer items or a hot spring where Pit can bask and heal up before continuing on. Similar to the Super Smash Bros. series, there are various challenges that can be completed to unlock new character and stage models, and an egg toss ‘mini-game’ (if it can even be considered such a thing) acts like Melee’s trophy vending machine lottery. While these eggs are given as rewards for completing each chapter and offer different rewards based on their colors, they can also be purchased with 3DS play coins. A multiplayer battle arena mode can be taken on with local friends or online in both team-based and free-for-all matches, which will also net players extra powers and weapons. Visually, Kid Icarus: Uprising is one of the best-looking games on the 3DS to date. While Greek and Roman mythos hold heavy sway over character designs, there is a significant amount of creative freedom shown in the designs of pirate starships and the war machines used by the forces of nature. Many of the weapons Pit wields bear either stone-like textures or dull metallic shines, while the flight segments of any given chapter do extremely well to play with lighting effects that dance off rivers or the interior chambers of some of the game’s larger fortresses. The soundtrack has a sweeping epic feel that evokes memories of a John Williams score on more than one occasion, very much befitting an adventure/action hybrid that tries so hard to blaze its own path in the realm of handheld gaming. While it is easy to be swept away by all the impressive feats that Kid Icarus: Uprising triumphs over and forget that it is a handheld exclusive, the game does trip up over itself on occasions few and far between. Certain stages suffer from poor choice in enemy placement - while it is always smart to check your surroundings before diving headfirst into battle, these particular areas don’t provide you that luxury. Were it not for the fact that you need to spin the camera around so often while on foot, the need to do this and attempt to dodge enemy attacks at the same time might not prove such an annoyance. Other stages do not seem to change up the number of healing items available from one difficulty setting to another, making their lower-level counterparts only slightly less so challenging overall, as this game is, at its core, for gamers who want an intense action experience, despite how unorthodox a hybrid design it might be. Still, even with this handful of missteps, Kid Icarus: Uprising is a bold gamble for Nintendo that paid off brilliantly, as it is not only one of the more original titles on the 3DS in terms of both gameplay and design, but also one of the most fun to play and replay. Set many years after the original Sin and Punishment, the Wii sequel, Sin and Punishment: Star Successor, sees two new heroes facing off against giant artificial creatures deep within the Earth and waves of grunt units beneath the waves of the ocean, in sandy deserts, and even in dreamscapes as they attempt to best their pursuers, the ever-persistent force known as Nebulox. Isa, son of Saki and Airan from the original Sin and Punishment, was previously allied with the Nebulox, but has since gone rogue in hopes of protecting his non-human friend Kachi from their intent to kill her as part of a supposed ‘will of the creators’. 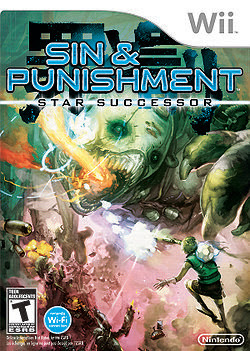 While perhaps not as immediately exciting a premise for opening up the world of Star Successor as the original Sin and Punishment’s cyberpunk rebellion presented, this long-awaited sequel is arguably more adventurous than its predecessor with a greater willingness to change up environment and enemy designs (thanks in no small part to the greater capabilities of the hardware it is running on being two console generations forward). The controls are simple enough – the Wiimote is pointed at the screen to aim, while the nunchuck joystick is used to move the protagonists around the screen. They can fire single shots, or simply carry out a constant barrage of blasts, as well as release a charged bomb blast every time the shot meter resets. Isa and Kachi can dodge in any direction to avoid incoming fire or environmental hazards, and the two have unique abilities that offer subtle differences in their play styles – Isa is able to switch between manual aim and locking on to singular targets, while Kachi can automatically lock-on and fire at multiple enemies. While firing shots from a distance will be the primary means for dispatching enemies, any foes foolish enough to get in close quarters with the heroes can be struck by a fast and powerful blade. None of the missions are particularly lengthy, though they certainly branch off into more open and brightly-colored areas than those in the original game. Star Successor’s soundtrack retains much of the original’s upbeat and exciting electronic style, while enemy designs range from techno-organic hybridizations more common to cyberpunk works to gigantic marine wildlife and exaggerated Japanese mythos. Boss fights are often multi-tiered, making them both mid-stage and end-stage highlights of the experience. The difficulty factor for Star Successor’s normal setting, on the other hand, has been toned down a decent amount from that of the first game, so players looking for a more grueling challenge may be somewhat disappointed. Aside from cooperative play, there’s really not much to speak of in the way of extra gameplay features. Once a stage has been completed in story mode, players can revisit it at their leisure from the mission select menu. Sin and Punishment: Star Successor is a game that is primarily focused on doing a few things really well – and in an era when shoot-‘em-ups are few and far between (especially those heavy on the arcade-style gameplay of Sin and Punishment), it handles these fronts masterfully. While it would be nice to have received a greater number of stages, what Sin and Punishment: Star Successor does offer in its existing eight missions are highly-polished and creative enemy designs, exciting environments, intense and diverse boss fights, and finely-tuned controls that make for a final product which dares to break the mold of what is expected of games in the modern era.